ST. MARIES — The Idaho Panhandle National Forests will be delaying the opening of the Emerald Creek Garnet Area until Friday, June 29, in order to excavate and stockpile the garnet-bearing gravel for visitors to sift through. This popular site traditionally opens Memorial Day Weekend. The excavation of the gravel is typically completed in the fall, so as to not impact the visitor experience during the summer months. Unfortunately, conditions this past fall were not conducive to completing the excavation work in a way that minimized disturbances to water and soil quality. The work was postponed to this spring, allowing for drier conditions to conduct the work with minimal disturbances to natural resources. Located near Clarkia, Idaho, the Emerald Creek Garnet Area is a popular rock-hounding destination, attracting local and international visitors and families. This is one of only two locations in the world where the star garnet, Idaho’s state gem, can be found readily! The Forest Service provides tools for sifting and sluicing to aid in finding the gems. Fees are charged to help maintain the facilities. Limited collection of rocks and minerals, petrified wood and common invertebrate or plant fossils for personal use is allowed on most National Forest System lands. These materials may be collected without a permit provided the collecting is for personal, hobby, and noncommercial use. Fossil Collecting - There are no established fossil collecting sites on the Idaho Panhandle National Forests, but a privately operated fossil collecting area is nearby to our Emerald Creek Campground. Rockhounding - Idaho owes its' nickname 'The Gem State' in part to the star garnets found in the Emerald Creek area of the Idaho Panhandle National Forests. At our Emerald Creek Garnet Area one can, for a small fee, search for star garnets. The IPNF is the only place in the world, outside of India, where these garnets are found in any quantity. One of the richest silver mining areas in the world is located in the middle of the Idaho Panhandle National Forests on the Coeur d'Alene River Ranger District. The "Silver Valley" created fortunes in the 19th and 20th centuries. Today the mining is scaled back and subject to the whims of the silver market. Here one can find rocks lying on the surface that are rich in minerals like galena - often associated with silver ore and today mined for it's lead content. St. Joe River Area - The St. Joe River area of the Idaho Panhandle National Forests includes most of what was originally established as the St. Joe National Forest and is now our St. Joe Ranger District. Most of our campgrounds are free and many are located adjacent to the Wild & Scenic St. Joe River. Our Route of the Hiawatha rails-to-trails mountain biking route winds across trestles and through tunnels. Our Emerald Creek Garnet Area is one of only two locations world-wide where one can find significant quantities of gem quality star garnets. Visit Marble Creek and view artifacts of early 20th century logging. Spend some time at one of our backcountry cabins or lookouts, or simply spend a day driving the St. Joe River road taking in the beauty of our rivers, mountains, vegetation, and wildlife. Resource Management - The Nez Perce-Clearwater National Forests have many important and wonderful resources such as fish, water, heritage, soils, silviculture, timber and geology. Feel free to read below about some of our resource management programs. As always, please feel free to contact us if you have questions. Suction Dredging - Suction dredging is permitted in several areas of the forest. The following information pertains to all locations. Regulatory Agencies - The U.S. Forest Service manages the surface estate of National Forest lands and is charged with ensuring that no adverse impacts to resources such as endangered species, water quality, fisheries, etc. result from prospecting and mining activities. Normally, panning or sluicing for gold using hand tools and non-motorized equipment is allowed without a Forest Service permit or bond. If an operation requires use of motorized equipment, suction dredges, results in the removal of vegetation, or causes significant ground disturbance, a prospector must contact the closest Forest Service district office to file a Notice of Intent to prospect or mine. (Please note: Some specified areas require a Plan of Operations to be submitted.) Once a Notice of Intent is filed, the district office will determine if a bond and reclamation plan is required. The Bureau of Land Management (BLM) is the federal agency responsible for managing the mineral estate of the United States. The BLM Idaho State Office manages minerals in Idaho and is the office in which a claim staked in Idaho is recorded. Please contact the BLM Idaho State Office at 208-373-4000 if you wish to stake a mineral claim in Idaho. The State of Idaho also regulates mining and prospecting. Visit their website for information on Idaho requirements for obtaining permits. The Salmon-Challis does not have a designated recreational gold panning area. The Forest Service does not generally regulate incidental recreational panning as long as the activity is short-term; however, digging in streams or banks with picks, shovels, or other equipment is not allowed without a specific authorization from the Forest Service. Occasional collection of small “pocket size” rock and mineral specimens is generally not regulated by the Forest Service. Use of metal detectors to locate mineral deposits, such as gold or silver, or to search for treasure troves or historical and pre-historical artifacts and features requires Forest Service authorization. Metal detectors can be used without a permit to search for recent (non-historic) coins and lost metal objects only in campgrounds and other such recreation sites. However, digging or other disturbance of surface resources to recover such objects is forbidden without prior authorization. Most other mineral-prospecting activities require specific authorization from the Forest Service. More information about rocks and minerals on the Salmon Challis National Forest is provided in the attached pamphlet. The U.S. Environmental Protection Agency (EPA) and the State of Idaho issue suction dredge permits with attachments indicating rivers and streams where the dredges are not permitted. The Salmon River and its tributaries within the Salmon-Challis National Forest are CLOSED to suction dredging. The permits do not cover these rivers and streams. The Central Idaho Wilderness Act of 1980 withdrew the Frank Church – River of No Return Wilderness from mineral location (cannot stake claims) and prohibits all forms of placer mining in the Middle Fork Salmon River and its tributaries in their entirety. Among the Middle Fork Salmon tributaries where placer mining is prohibited are: Loon Creek, Marsh Creek, Elk Creek, Bear Valley Creek, and Rapid River. The Role of the Forest Service - National Forests are not owned by the Forest Service, they are owned by every citizen at birth or naturalization. With the mantra of "caring for the land and serving people" the Forest Service strives to manage your National Forests, harmonizing use with protection of these very valuable natural resources.It is important to be aware that the creation of Forest Reserves, and eventually National Forests, is closely tied to the public. At the turn of the century, public outcry about the "needless destruction" of forests and the "rapid consumption" of natural resources prompted appeals to protect our forests and everything they encompassed, including water and wildlife habitat. Environmental leaders, such as Theodore Roosevelt, Ralph Waldo Emerson and Gifford Pinchot initiated setting aside tracts of land to protect these resources. Forest Reserves were established to protect use and achieve sustained yield so that resources could be used but not to the point where the health of the forests would be compromised. Unlike the National Park Service who is dedicated to preservation, the Forest Service strives to balance between timber harvest, grazing, water protection and recreation, just to name a few. All while ensuring the long term health of our forests. The concept of managing for many different purposes is called multiple-use and it can become a delicate balancing act to find the optimum combination of use versus protection. The Forest Service and its employees are public servants tasked with trying to "provide the greatest amount of good to the greatest amount of people." But what is the greatest good for the greatest people? That's where you can help. The Role of the Citizen - A very important piece of legislation, known as the National Environmental Policy Act of 1969 (NEPA), was enacted to meet an increased public desire to become more involved with government decisions as they apply to public land. "The purposes of this Act are to declare a national policy which will encourage productive and enjoyable harmony between man and his environment; to promote efforts which will prevent or eliminate damage to the environment and biosphere and stimulate the health and welfare of man; to enrich the understanding of the ecological systems and natural resources important to the Nation; and to establish a Council on Environmental Quality." While NEPA may sound like just another government acronym, it is the most powerful law governing land management. NEPA requires public land management agencies to seek public comment, disclose the effects of decisions and analyze alternatives. NEPA uses three categories to analyze project criteria and potential environmental impact. However, not all projects are required to go through the NEPA process. If every single decision was required to go through NEPA, the Forest Service could become so bogged down in paperwork that it would become ineffective. Projects that are exempt from NEPA are administrative, maintenance or actions that do not have a "significant effect on the quality of human environment." Examples of excluded projects would be mowing the lawn at a Forest Service office or resurfacing a road to its original condition.Projects vary in size and scope so opportunity to comment also varies. To become involved you can request to be put on the mailing list to receive the Schedule of Proposed Actions (SOPA) . This is a quarterly produced document that details every project taking place on the National Forest that has decisions documented in NEPA. They will be in the form of a decision memo, decision notice, or record of decision. The SOPA contains description, location, and current status information for each project as well as the primary contact person for specific projects. If you wish to be provided opportunities to comment on that project, the first step is to get a hold of the primary contact and request to be added to the project mailing list. Mineral Prospecting and Mining - Mineral prospecting and other mining-related activities (i.e. use of sluice boxes, suction dredges, pick and shovel work) are considered commercial endeavors, and not a recreational activity. The right to enter federal lands to remove valuable minerals such as gold, silver, or copper is governed by the mining laws like the General Mining Law of 1872 and the Surface Resources Act of 1955.Information about mining regulations for federal lands can be found in 36 Code of Federal Regulations 228, or by contacting the Minerals Specialist on the Whitman Ranger District. Recreational Gold Panning - Gold panning is an enjoyable past time for some visitors on the National Forest. Visitors may pan or search for gold on federal lands in the west, but they have the responsibility of knowing where to legally pan to avoid areas claimed by others. There are over 1500 active mining claims on the Wallowa-Whitman National Forest, with new areas claimed each day. Panning or searching for gold on someone's legal claim can be considered “claim jumping” and is not allowed. By law, mining claims should be marked on the ground generally by posts or sometimes paperwork for the claim is in a jar nailed to a tree. However absence of such markings does not mean the area is not legally claimed. Many areas in Wallowa, Union, and Baker County that are near roads or streams may already be covered by existing claims, and are not available for gold panning to visitors. If you want to review a specific area, please check with the local courthouse or BLM website that tracks the status of active mining claims in the state. Areas Closed or Withdrawn from Mineral Entry - Areas closed to mineral entry include administratively 'withdrawn areas' such as the Hells Canyon National Recreation Area, designated wilderness areas, “wild” portions of wild and scenic rivers, administrative sites like campgrounds, recreation rentals, and special places such as the Ah Hee Diggings near Granite.Books or internet web sites listing Antlers Guard Station, Deer Creek, McCulley Forks, and Eagle Forks campgrounds and Mason Dam Recreation Area as “recreational panning” areas are outdated and that information found in them is incorrect. The Wallowa-Whitman National Forest does not have any designated recreational gold panning areas. The following is the latest information sent out to the members of the NFMS as of April. I would like to thank all of you for taking action concerning BLM’s actions concerning rockhounding in the sage grouse areas. We are at a point now where the only way to maintain the use of tools for recreational rockhounding is to have our Congressional Representatives get involved. Two bills have been introduced in the House and Senate but have not been moved out of committee. We need to get our Representatives and Senators to support Rep. Rob Bishop’s and Sen James Risch’s bills that will delay the sage grouse land withdrawal and provide for state and local input into sage grouse protection. If the bills are not passed into law before September 2017 then the restriction on the use of tools for rockhounding will become final. Please take the time to contact your Representatives and Senators let them know you support these bill. This bill addresses the Department of the Interior's October 2, 2015, finding that the greater sage grouse is not an endangered or threatened species. Until September 30, 2027, Interior may not alter or invalidate the finding. Additionally, Interior and the Department of Agriculture (USDA) are prohibited from amending any federal resource management plans that affect the greater sage grouse in a state in which the governor has notified Interior or USDA that a state management plan is in place. SEC. 4. PROTECTION AND RECOVERY OF GREATER SAGE-GROUSE. (1) DELAY REQUIRED.—The Secretary of the Interior may not modify or invalidate the finding of the Director of the United States Fish and Wildlife Service announced in the proposed rule entitled “Endangered and Threatened Wildlife and Plants; 12-Month Finding on a Petition to List Greater Sage-Grouse (Centrocercus urophasianus) as an Endangered or Threatened Species” (80 Fed. Reg. 59858 (October 2, 2015)) during the period beginning on the date of enactment of this Act and ending on September 30, 2027. (2) EFFECT ON OTHER LAWS.—The delay required under paragraph (1) is and shall remain effective without regard to any other statute, regulation, court order, legal settlement, or any other provision of law or in equity. (3) EFFECT ON CONSERVATION STATUS.—The conservation status of the greater sage-grouse shall be considered not to warrant listing of the greater sage-grouse as an endangered species or threatened species under the Endangered Species Act of 1973 (16 U.S.C. 1531 et seq.) during the period beginning on the date of enactment of this Act and ending on September 30, 2027. We are asking you to contact your Senators and Congressmen asking that the Boulder- White Cloud area in IDAHO not be made a national monument. 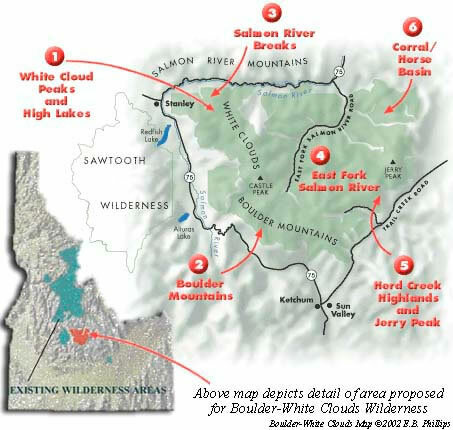 Our Senators and Congressmen must know we, rockhounds, and there are thousands of us in the Northwest, want the Boulder- White Cloud area to remain as is. The National Monument status could effectly stop rockhounding within this area and severly curtail all other recreation there.